Why Choose Atlantic STS for Security & Telecom Solutions? Quite simply, we are committed to finding the right solution for YOUR business. Unlike most telecom companies, we are platform (and vendor) agnostic. We work with many of the major brands of security and business telephone system manufacturers so that we are able to fashion systems and solutions from a comprehensive set of options. This is very uncommon in the telecom industry; most companies represent a single manufacturer or platform, and will try to find a solution for their clients from the single brand they distribute. Our philosophy is firmly centered on the fact that no two businesses are alike. Each company has special considerations, requirements and needs that must be fully taken into account to provide the optimal solution, within budget, and with room to grow. We sell, install and support digital and VoIP business phone systems from a variety of leading manufacturers. 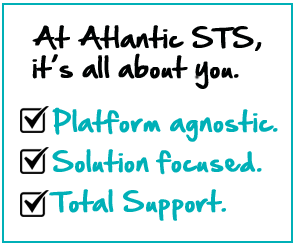 Atlantic STS represents all of the major providers, enabling us to find the best solution for your business. Video surveillance systems, access control, alarm systems and security monitoring and consulting services.